Perthshire is one of Scotland's most remarkable areas of natural beauty and a firm favourite with holiday makers. For those looking to invest in a second home or holiday let in the region, CKD Galbraith is marketing the perfect holiday properties nestled in picturesque countryside locations. With so much on offer in the region it is no wonder visitors come from across the world to experience it but also that it remains a popular hot-spot with staycationers as well. Perthshire has an abundance of history; adrenaline filled outdoor activities, outstanding food and drink, a vast array of wildlife, and holds some of the biggest and best events such as the recent Open Championship at Gleneagles. CKD Galbraith's Perth office is currently marketing a number of homes which would make the ideal second homes or holiday lets. Calm Waters is a beautiful contemporary built house with superb entertaining spaces within the popular Mains of Taymouth development located in Kenmore near scenic Loch Tay. The property comprises of three well-proportioned en suite bedrooms, an open plan sitting and dining room with oak flooring and stunning double height ceilings. There is also a Juliet balcony immediately off the sitting room area and off the dining area there is a spacious terrace with decking and lighting making it the perfect area for using at all times during the day or in the evening. The property is currently used as a holiday let and has proven to be a successful and popular property over previous years. Calm Waters is currently on the market for offers over 318, 500. 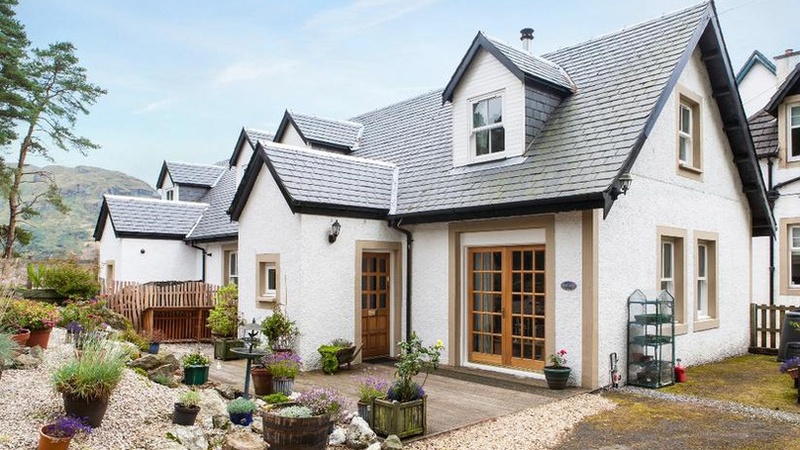 Cnoc Mhor and Redgorton are two charming adjoining and interconnected cottages nestled within the Highland countryside, three miles from the pretty town of Aberfeldy and only 35 miles from the city of Perth. These two properties offer superb potential and flexibility as holiday lets as they could be let individually or by one larger party. Redgorton is a stone built single storey house, with a double bedroom, which has been modernised retaining many original features. Whilst Cnoc Mhor, is a traditional two storey cottage which has a further three bedrooms and also includes an attached former byre. The gardens are landscaped with a lawn, small copse with a delightful array of snowdrops and daffodils, lawn and a mixture of stone walls and mature trees offering any guests privacy yet still allowing outstanding views over the surrounding countryside. Cnoc Mhor and Redgorton are currently for sale as a whole through for offers over 350,000. Alternatively, Mains of Soilzarie, located in the Bridge of Cally, offers buyers the opportunity to purchase a most wonderful country house with five bedrooms as well as the option to earn additional income from a separate coach house. The main house at Mains of Soilzarie has been modernised and extended over recent years to provide a comfortable family home with well-proportioned rooms and a generously sized kitchen forming the heart of the house. The bedrooms lie on the first floor with one serviced by its own en suite whilst the further four bedrooms are serviced by the two other bathrooms. The coach house has been carefully upgraded by the current owners and is now used as a well presented holiday let property. There accommodation features a coast dining and sitting room centred on a stone and timber fireplace whilst the first floor comprises of the two bedrooms, two shower rooms and walk in store room. Mains of Soilzarie is currently on the market for offers over 575,000. Willow Cottage sits in a superb position close to the banks of Loch Katrine and within easy reach of Aberfoyle. The house is beautifully presented and immaculately maintained throughout, providing comfortable and usable accommodation laid out over two floors. The first floor accommodation consists of a master bedroom with en suite, whilst two further double bedrooms can be found on the ground and first floor. The Trossachs are renowned as one of Scotland's most rugged and inspiring areas and provide something for everyone making this the ideal Perthshire holiday let for all seasons. Willow Cottage is currently on the market for offers over 185,000. "The location of all the properties has an extremely high level of visitors making it the ideal region to purchase a house either as a second home to let to or as a holiday house to enjoy for yourself." "There has been a 21% rise in the number of properties coming the Perthshire market in comparison to the same period last year. It is also of notable interest that the area attracts a high percentage of buyers from the national market many of whom are taking advantage of the beautiful surrounding countryside and the range of outdoor activities available."